Living in the Shadow of His Hand: Be Yourself! To read this verse, you'd never think it came from the mouth of a man who was willing to kill Daniel for not bowing to him and worshipping him. King Nebuchadnezzar called God "the living God", and said "whom you serve continually". The Bible tells of it, but with just this one verse, it's obvious Daniel had shown his relationship with God to the King. And because Daniel did this, in spite of the threats and roaring lions, the King knew the living God. I've come to realize something in the past 10 years or so. The more I voice my relationship with Christ, the more I make it an open topic, and the more I find that there are Christians all around me. They are silent about their relationships because no one has opened the door to the freedom to speak. Some of my best relationships started with simply voicing that I cannot separate the Christ in me from who I am. For me, it would be like trying to drop my accent, or to masquerade as someone else. I am who I am, and being in Christ defines me. We've been slowly and quietly silenced by popular opinion, the fear of being offensive, and sensitivity training. Friends, I'm here to tell you that you should NEVER hide who you are in Christ. Jesus speaks about this in Luke 9:25-26, saying "For what profit is it to a man if he gains the whole world, and is himself destroyed or lost? For whoever is ashamed of Me and My words, of him the Son of Man will be ashamed when He comes in His own glory, and in His Father’s, and of the holy angels." Ashamed. That's not what I want to hear at his coming. Friends, we're hear for one reason: To make God famous. 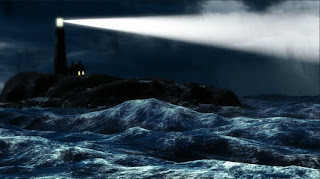 We are lighthouses in the darkness for those that look for peace and forgiveness. But if you're light is overshadowed by a fear of shining, they'll never find you. Go ahead! Be yourself! It's better to offend those in this temporary life, than to offend the One who you will live with eternally. Let the lions roar! They can't harm you.